For us, little beats taking the train to go for a walk. Many railway lines pass right through the heart of the countryside, giving you unrivalled views before you’ve even got your boots muddy. Whether you get off at a busy station or an isolated outpost, you’ll arrive raring to go after a relaxing journey. There are even lines where, dare we say it, the journey is better than the walk. Particular highlights in the UK are the Settle–Carlisle line through the Yorkshire Dales, or Scotland's West Highland Railway. OK, as good as the walk, not better. Nothing's better. Shop around for tickets in advance – there are often limited special fares available - and if you're travelling with 3 or more companions, don't forget to ask about group discounts, too. Read our Top Tips for Cheaper Train Travel. Some remote stations are request stops – check beforehand and let the guard know if you want to stop there. 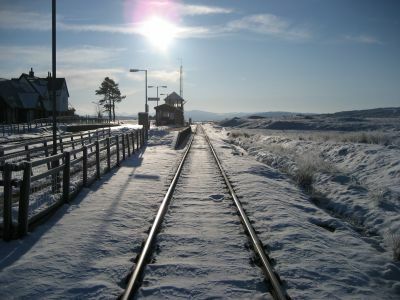 Check the timetable before you head off for your walk – some train routes vary with the seasons. You can use two nearby stations to make your own linear car-free walk – just pick your own path between them. Heading for some European car-free walking? The Man in Seat 61 will help you get there plane-free. So book your ticket, buy a coffee, and set forth on the iron road!